When I use the term pantry, by the way, I am including the refrigerator and freezer as pantry sources. Although it’s possible to can milk, it really tastes a lot better when it’s fresh and cold. Another advantage of a pantry is that it allows you to stock up on quality foods when they go on sale. Organic canned tomatoes, for example, are extremely versatile, store well and in most recipes are the equivalent or even better than fresh (especially if fresh is those cardboard red things). I like to buy Parmesan cheese in a half wheel – about 10 pounds – and cut it into strips that fit easily into my food processor shredder. These freeze readily and keep well. When I want Parmesan, I pull out a few chunks, run them through the processor and toss in the recipe. Everybody’s pantry is different, but there are some basics; salt, sugar, flour, corn meal, oatmeal, rice, pasta, baking soda, cream of tartar (combine with baking soda for baking powder), cocoa, vinegar, canned goods, frozen meat, canned or frozen fruits and veggies, eggs, milk, butter, onions, garlic and some basic spices. I favor cinnamon, vanilla, chili powder, oregano, basil, cayenne and black pepper. I also grow rosemary, parsley, sage and thyme. With these things in my pantry I can pull off a quick snack or a five-course meal. For example, if I have cocoa, sugar and vanilla, I can make my own chocolate sauce for hot cocoa or to drizzle over vanilla pudding. Canned diced tomatoes, garlic, green onions, yellow onion and cayenne make great salsa. Hamburger, onions, garlic, diced tomatoes, cornmeal, eggs and milk make tamale pie. If I’m looking for sinful indulgence, there’s homemade cream cheese and sour cream for cheesecake. Frozen corn, onions, scallions from the garden, potatoes, milk and cream make potato chowder. Cooking from the pantry takes flexibility. Instead of looking at the recipe and going out to buy the ingredients, you look at the pantry and figure out what you can make with what you have. Hamburger but no cornmeal – forgo tamale pie and make shepherd’s pie with a potato crust instead. Extra cream – make cream biscuits instead of the classic baking powder type (these also freeze well, so double the recipe and keep a batch on hand). No butter – that almost never happens at my house because of Maybelle the milk cow, but if it did, I would use lard and tallow instead of butter for many recipes. 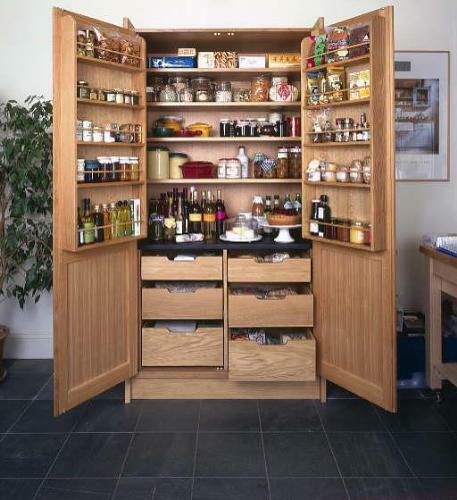 Yes sir, a pantry is worth every inch of space you devote to it!